A quick glance out of the plane window as we made our final approach to Queenstown Airport was enough to get me excited – the scenery looked incredible! Big rugged hills and huge lakes, any jaded thoughts of the 25,000km already cycled disappeared and I couldn’t wait to rebuild our bikes and get cycling. We’d arranged to meet Stef & Ange in Queenstown, who we’d stayed with 16 months ago in Vienna. They’ve since been on their own cycling trip for the last 10 months, so it was great to catch up with them and have some cycling buddies for a few weeks! The task for our first day of cycling after nearly two weeks off since arriving in Sydney was to cross the Crown Range to Wanaka. The summit is the highest paved road in New Zealand at 1,076 metres and it was a brute of a climb at times – the steepest gradients we’d seen since northern Laos. The views were awesome though and made it worthwhile. After hiding from a day of solid rain in Wanaka we cycled over the much gentler Haast Pass and up the west coast. We had regular soakings from the unpredictable weather, as in Australia it seems this part of the world is having one of the worst summers in recent history. Thick green forest lined the road most days, at times it felt like we were boxed in by walls of ferns. After Hokitika we turned inland to tackle Arthur’s and Porters Passes. Hana (last seen with Mark in Malaysia) came over from her home in Lyttleton with her bike to meet us and cycle three days back to the east coast. The weather was pretty terrible again, and we got drenched. Arthur’s Pass was even steeper than the Crown Range, it took all my strength to keep the pedals turning and at times Stef’s fancy cycle computer showed the gradient to be a hefty 21%!! I was bloody glad to see the summit, although it felt freezing up there in my sweat/rain soaked clothes. We had a 5km roll down the other side to the village, so I quickly put a couple of dry layers on to avoid an almost certain death by frostbite in this balmy Kiwi summer. Once over the final lump it was downhill for over 100km to Christchurch, but instead of a pleasant spin we battled horizontal rain and a cross-head wind – horrendous cycling conditions! We made it eventually, just beating Mark home from a week of climbing down south. We went to see Christchurch city centre which is still closed down from the tragic earthquake that struck over a year ago. The entire CBD is cordoned off, and a new shopping street made from shipping containers has opened. It was shocking to still see piles of rubble where buildings used to be. The damage was extensive – Lyttelton (the small town where Mark & Hana live) lost its only supermarket, and most buildings have at least some damage (M & H have a huge crack down the wall in their living room). During one of our three rest days in Lyttleton we drove back to Arthur’s Pass to walk up Avalanche Peak. I’d never stood on the top of a proper mountain, so being in a country with loads of big hills and staying with two avid climbers was too good an opportunity to miss. It turned out to be harder than I’d imagined! I guess I’d had no idea what to expect, but a 5 hour return trip over very steep terrain certainly woke me up. Some of the ridges near the top were spectacular and felt quite exposed to me. When we reached the summit we were surrounded by cloud and couldn’t see a thing, but suddenly it lifted and some amazing views lay before us. Bex and I were knackered by the time we’d got back down, and having done nothing but cycle for 18 months meant our legs were in agony for about 5 days after – we could literally barely walk! An awesome experience, thanks M & H! Whilst we were at the top of Avalanche Peak a few Keas (mountain parrots) came to investigate. They are super-confident, and if you turn your back on your backpack for even a second a Kea will hop over to steal your lunch. At least their cockiness meant it was easy to get nice and close for a few photos! We left Lyttelton/Christchurch with wooden legs in a five-man peloton with Mark, Hana and Stef (Ange had finished her trip and flown home from Christchurch). We were headed for the Rainbow Road, a gravel track that follows the Clarence River Valley. After a short but steep climb up over Jacks Pass we descended into the valley, and the temperature began to drop. We spotted an old hut and piled inside for the night. It was good fun with the five of us rolling out our sleeping bags, but it was super cold – we wore all our clothes at night but still woke up shivering. Mark’s sleeping bag was the worst of the lot (he carried a camera lens that was bigger than his packed bag) and said it was his coldest night ever – not bad for someone who has spent plenty of nights up big mountains! We woke to a thick frost outside and quickly boiled some river water for a round of teas. We waited for the sun to appear before we started cycling, and the scenery was spectacular – it felt like we were in Central Asia again. The track was really tough in places, the steep slopes and large rocks were hard work with heavy bikes and on one sharp climb a cheeky Bex even persuaded one of the rare 4-wheel drivers skidding past to take her panniers to the top and wait for her there (30 minutes). But the faster sections were great fun, and despite Bex hating skiddy roads I was proud to see that she battled on, even if she was slower downhill than uphill! It’s definitely made me want to do some mountain biking after we get home. After saying goodbye to Stef, Mark and Hana, we took the ferry from Picton across to the North Island. We’re really on the home straight now – there’s only about 700km left until Auckland (even less now, as I write this a few days later) and I’m pleased to say I’m feeling mega excited about the prospect of finishing. Let’s hope it stays that way! I was gasping for breath within a few hours of leaving Perth. As it turns out, Australia is not flat. The notorious flies that we’d been warned about appeared almost instantly and I fought to stay upright whilst swatting, spluttering and swaying slowly up the hills. I tried to keep my mouth tight shut (difficult when boiling hot and working hard) but one would buzz up my nose, causing me to snort and inhale through my mouth, whilst another would quickly dive down my throat. By the top of the first climb I had a belly full of flies. It wasn’t funny when Ryan cheerily told me it was just an extra bit of protein, so I decided to dress like a desert trooper and put on my claustrophobic fly net. For the rest of the cycling in Western Australia we kept these within easy reach, ready to whip out as soon as a swarm appeared. I was feeling a little bit frazzled by the end of day one. We had all of our camping gear back, and were already carrying a full day’s worth of water (about 7 litres each) as the first town after Perth was 140km away. Before looking at the map I’d imagined that there’d be regular towns for at least a few days out of Perth, but within an hour of cycling we were already out in the bush with no sign of civilisation. This meant right from the start our bikes were very heavy. My sherpa went on strike months ago, which was OK when I didn’t have so much to carry, but I was really feeling it now after a slightly slack month cycling-wise. After a leisurely finale to SE Asia it was a bit of a shock to be pushing ourselves this hard. We had set our sights on arriving in Adelaide for Christmas, around 2,800km away, so the pressure was on to get some miles under our belts. We became quick at setting up some shade and our mosquito net between our bikes because every time we stopped for a rest we got eaten alive by horse flies and mosquitoes. My saddle sore bum seems to be a mosquito’s favourite dish, and I noticed Ryan started to hover near it whenever we stopped as it acts like a human mosquito shield to anyone nearby. Amazingly we found a Warm Showers host, Ryan H, in a farming village called Varley. This would be our only night in a bed until we got to Adelaide and it felt good to stretch out and not have to unpack everything. We were given some tips for bush camping and sensible advice about finding water. Ryan H took us to see the Rabbit Proof Fence which runs for thousands of kilometres to keep rabbits out of the wheat fields of Western Australia, and taught us about the wildlife we might encounter in the outback. Spending time with people who actually live and work in the bush was really good and put an end to any anxieties that had been born from city folk warning us of the many dangers they thought we would face. Ryan H assured us there really isn’t too much to worry about. Despite there being plenty of deadly spiders and snakes, none of them are predators so we just got used to tramping around making LOUD NOISES when setting up camp, and we’ve only had one encounter so far (with a Huntsman spider). Throughout Australia wild camping is easy and you could sleep for free every night if you chose – just find one of the many natural clearings in the bush and pick your spot. There are also designated rest areas alongside most roads which have some shade, maybe a picnic table and once or twice even a toilet. In some towns we’ve found beautiful free camping areas with BBQs, fresh rain water and often other campers to share a coffee with. 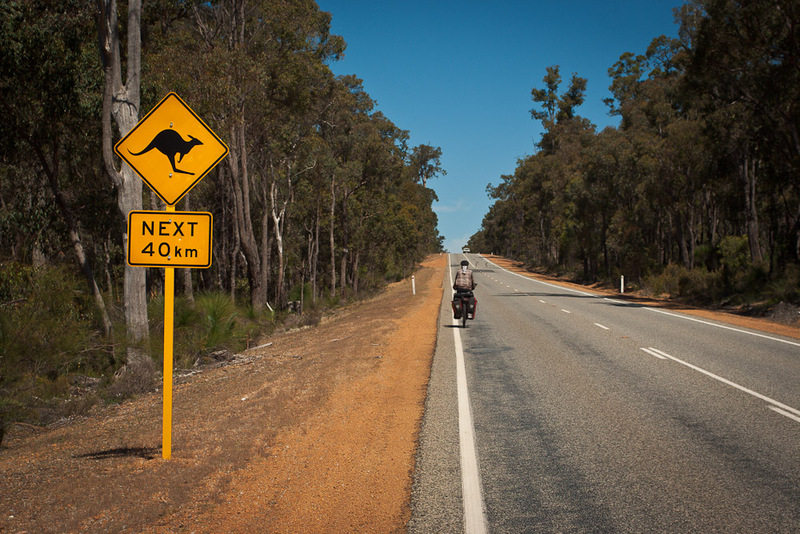 This aspect of Australia makes the country a brilliant place to cycle tour, and despite the horrendous exchange rate at the moment it can still be done on a shoestring budget. We went to Hyden and took some obligatory photos at Wave Rock, before doing a detour south to Esperance where we got to tour around some spectacular beaches after we met a friendly law professor who offered to show us the sights. We had lots of planning to do as this was the last place that we could buy food for the next two weeks. Although we would pass road houses every 100km or so where we could refill our water bags, we weren’t planning on eating in them because they only sell expensive pub-style meals, as opposed to cheap ingredients to cook yourself. We did some calculations as to how much we would need to eat, and went shopping for 2.5kg oats, 3kg pasta, 8 meals of instant mash etc. Our diet for the nest two weeks would consist entirely of packaged foods and there would be no room for a Bex-special cookie binge as strict rations applied at all times. This was going to be the hardest challenge so far! We were keen to take an off road track that would take us straight from Esperance to Balladonia, avoiding the main road and cutting off 150km. Locals had mixed opinions about whether we could cycle the track, but we’d read about a guy who rode it last year so we knew it was possible and decided it would be an adventure we shouldn’t shy away from. As we wobbled out of Esperance with 12 litres of water each and our panniers bursting with food, it felt like I was riding a tank. My bike weighed more than me and my thigh muscles bulged with each pedal stroke. I started to think that taking a 4-wheel drive track when the bikes were at the heaviest they have ever been was perhaps a little foolhardy!! We turned north away from the sea and the smooth road slowly deteriorated to rocks and corrugated sand which rattled us to the bone. Luckily a blanket of clouds and a cool breeze kept the temperature down, and we really enjoyed having the road to ourselves. About half way along we found an abandoned homestead with a full water tank and swarms of flies making a deafening buzz. We decided to camp nearby so we could make use of the water. Although I’m totally at ease with camping wild now, there was something really creepy and sinister about this run-down house in the middle of nowhere and I was keen to get moving the next day. As the hours ticked by I started to ponder how alone we were out here, we hadn’t had any phone reception since leaving Esperance (and that was the first time our Vodafone sim card had worked since leaving Perth) and only a few cars had passed all day, we were unlikely to see another. More and more hours of rattling and bumping passed until we eventually heard the familiar hum of traffic, which grew louder until we popped out onto the famous Eyre Highway at the Balladonia roadhouse. Tired and relieved, we were greeted by a surprised owner who couldn’t believe we’d cycled up the track, and collapsed into our tent. It was a great micro adventure and certainly worth the extra effort over the longer but simpler highway. The next day we woke at 5.30am and the wind was calm, but by 6.30am it had begun to pick up, and by 9am it was in full swing. We decided that we would creep the alarm forward and get up at 5am tomorrow. The first few days were fun and we even got a rare tail wind on the 90-mile straight, the longest bit of straight road in Australia. We were excited to finally be pedalling this infamous road and were pleasantly surprised that the traffic wasn’t as busy as we thought. Giant road trains roared past every 10 minutes or so, the biggest ones with 3 trailers, but all the drivers were great and gave us a huge wide birth. Occasionally if two were coming from opposite directions we would pull off the road, as there was no way we could all fit on the narrow strip of tarmac and we had significantly more to lose if there was a collision. As the name suggests (Nullarbor = no trees in Latin) the sparse vegetation consists of low salt bush and blue bush scrub and no trees. The full 1200-odd km between Norseman and Ceduna is referred to as the Nullarbor, but the road only travels across the official Nullarbor Plain for 30km (although the plain covers a huge area a to the north). To be honest it didn’t feel hugely different from the rest of it to me – even with the odd smattering of trees the whole place still looked pretty barren from my seat. The never ending horizons of bush, more bush, red/brown dirt and scrub were demoralising when we battled tirelessly into the wind. We prayed for something different every time we went over a new horizon, but it never came. The road just went on and on and on, and hence we now have a big collection of photos of long, straight roads. We began creeping our alarm earlier and earlier each day, from 5.30am to 5am, 4. 30am to 4am, and finally 3am in an attempt to beat the wind. I suppose it worked as we could get an hour or two of riding done before the winds really picked up, but it did mean getting up in the pitch black and cold. One good thing about an early start is that we got to watch sunrise, and it was really awesome most days. The bush is full of kangaroos at dawn and there are very few people on the roads at that time. We could zoom along side by side enjoying the new day and getting some fast miles done before breakfast. By the time the sun was up we could strip off our fleeces and get ready for a good searing as the temperature increased. The wind was our own personal nightmare all the way to Adelaide. People we met kept jovially telling us how lucky we were that the prevailing wind would blow us all the way across Australia. I had to use all my control not to grab them and shove them out onto the road where it was clearly IN MY FACE all day. Don’t try and tell me it’s a tail wind from your comfy air-con camper van whilst eating cookies and drinking iced coffee! One of the benefits of travelling at a snail’s pace was that we had plenty of time to look around and whereas in a car the scenery can look totally dull, we were able to see lots of wild flowers and animals in some parts. Given how dry the land is, I was amazed at how much manages to live out there! We saw parrots, budgies, wombats, snakes, spiders and hundreds of kangaroos. Sadly there would be a dead kangaroo every few metres on some sections as they run across the road in front of road trains. As we crossed from Western Australia to South Australia the bush fire warnings increased. As many signs proudly proclaimed, South Australia is the driest state in the driest inhabited continent on Earth and combined with ferocious dry winds the tiniest spark can cause a fire to rip through hundreds of kilometres of bush in no time. We’d mostly been lucky with the temperature not being too hot, but we started to have a few warmer days. By this time we were both physically exhausted and it became a battle of wills to keep going. I felt so small in this vast desolate landscape, it was hundreds of kilometres in any direction to the next town and the fact that you could see endlessly was overwhelming. In England, as in most places, we are always surrounded by hills or plants or trees or buildings or people… this was very different and was becoming very monotonous day after day. The next time a road house appeared we decided we had earned a treat. Ryan ordered the biggest thing on the menu, “The Gutbuster” burger. With a flurry of excitement the owner went to prepare our meals and returned with a burger the size of a small child on a plate. Of course Ryan ate it all, much to everyone’s amusement, and some of my chips. The Gutbuster morale train lasted a day or two, but our enthusiasm began to dwindle again as the days dragged on and on, the horizons never changed, and the wind never stopped. Just as we were ready for a change, the road turned towards the Southern Ocean and we got a new view! Spectacular cliffs and crashing waves were a fantastic distraction to the windy cycling and we regularly took little tracks to get a look at the sea. Finally, 14 days after leaving Esperance we made it to Ceduna, which marks the end of the famous Nullarbor crossing and the first town in over 1200km. As a result of repeated long days spent pedalling into the headwind, our legs were very tired – probably the most tired they’ve been all trip. Ryan announced that he would be spending his day off in the local supermarket, and I had shower after shower. From Ceduna we had another 10 days cycling before we made it to Adelaide, but from here on we would be cycling through a village or tiny town most days. The final four days leading into Adelaide took us via the Clare Valley and some beautiful hills. The region is famous for it’s vineyards, the scenery was green and rolling and the little towns plentiful in comparison to the previous month. We found shops every day and were invited to a Christmas BBQ in one town, which perhaps they regretted once Ryan attacked the spread with gusto and returned several times for more. After dreaming of a lazy Christmas break in Adelaide for so long we finally arrived at speed, being blown along by a tailwind for the first time in weeks. We’d been invited to stay with the Halliday’s, and we were greeted by a lively family, a glass of chilled white wine and a steak – amazing! All the hours spent slogging across the Nullarbor were instantly forgotten. Our Christmas break was perfect, and much more fun than last year in Turkey where Christmas doesn’t exist. Although it’s taken 2 years of disappointment, Ryan has finally realised that he now IS Father Christmas and we enjoyed opening stockings, attempting to cook a roast and drinking bottles of local red wine. We were welcomed with open arms into the hustle and bustle of family life in the Halliday household and managed to fit in a few days at their “shack” on Murray River. The house sits right on the banks and is perfect for speed boat rides and teaching stiff old cyclists how to water ski. Life here is good and I envy the warm weather and outdoor life that is so easily found in Australia. I’m going to be sad to say goodbye, but as I struggled to get my cycling shorts on over my Christmas Belly yesterday, I think it’s time we got back on the saddle. We set off again this morning, heading for Melbourne 1000km away. We’ll be cycling along the coast all the way to Sydney now, and as we’ve covered over half of our Australian kilometres in one third of our Australian days, the next few weeks should be a bit more relaxed than the stint from Perth. If you need to buy any kit from the shops listed below, we'd really appreciate it if you could click these affiliate links. It makes no difference to the cost, but gives us a small commission which helps to cover the cost of maintaining this website. Thanks!